In the face of new challenges, Germany is recommitting itself to the Nato alliance. But what will playing a more central military role mean to a country that has often been accused of reluctance about its armed forces? It was an unseasonably mild morning as the Sun rose slowly over the training range at Pabrade in Lithuania. This is effectively Nato's eastern front. Belarus is just a few kilometres away, with Russia beyond. Lurking just outside the perimeter wire loom several Leopard battle tanks of a German armoured battalion. So what are the Germans doing here and what is the significance of this deployment for Berlin and for the Atlantic alliance as a whole? Germany commands the Nato multinational battle group in Lithuania, intended to reassure a small ally in the face of a more assertive and aggressive Russia. Other countries command similar formations in the two other Baltic states - Estonia and Latvia - and in Poland, the whole mission being known in Nato-speak as an "enhanced forward presence". Here in Lithuania, Germany is the so-called framework nation, providing the headquarters and a significant proportion of the troops. Other smaller Nato countries also provide troops for the German-led force. Currently there are contributions from Belgium, the Czech Republic, Luxembourg, Norway and the Netherlands. The whole German battle group then forms part of a larger Lithuanian brigade. It aims to promote democratic values and for members to "consult and cooperate on defence and security-related issues"
This deployment has both a practical and symbolic significance for Germany. German Defence Minister Ursula von der Leyen told me: "The Lithuanian people can rely on the German forces to protect them, to reassure them, to train with them." Lithuanians should feel absolutely certain, she said, that "if 1 sq cm of Nato territory is attacked, we will all stand together to defend it". That is the goal of the "enhanced forward presence" strategy in a nutshell. But Germany was not always so eager to put itself forward in military matters. Revulsion at the horrors of Germany's Nazi past fostered a deep mistrust of militarism and the military. But, to a large extent, attitudes have been changing. The German military was engaged in Nato's Kosovo operation and played a significant role in Afghanistan. But it was Russia's annexation of Crimea and its wider military intervention in eastern Ukraine that really began to shift German opinion. Ms Leyen summed up the change like this: "Nowadays, having a large political relevance, being a certain economic power, we cannot shy away anymore. We have to say, because of our history, we have to get involved." Germany volunteered to be one of the framework nations for the enhanced forward presence plan. It commands one of the deployed battle groups, along with the UK, Canada, and the US. But this is only a prelude to a larger Nato role. On 25 October, Nato's major exercise Trident Juncture 18 kicks off in Norway. This, the alliance's biggest exercise since 2002, will be an opportunity for German forces in particular to show their capabilities before they assume the command of the Alliance's Very High-Readiness Joint Task Force in 2019. For that year, German forces will be at the tip of Nato's spear. 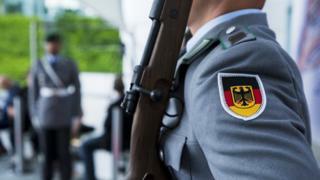 But does Germany have the military means at its disposal to fulfil the new roles it is taking on? Over recent years, the German press has paraded a litany of stories about the inadequacies of Germany's armed forces: submarines and aircraft that were not operational, shortages of personnel and spare parts and so on. In the wake of the Cold War, Germany's armed forces were essentially hollowed out and maintained at well below full strength. With the arrival of Donald Trump in the White House this became not just a military problem but a diplomatic one too. He pressed all Nato allies to spend more. They ultimately agreed a defence spending goal for each country, that some 2% of its gross domestic product (GDP) - the value of all the goods and services it produces - should go on defence. German spending was well below this figure and, given its economic strength, it came in for particular criticism from Washington. Ms Leyen has battled to increase German defence spending, with some success. More money is going to the armed forces but there are still political differences within the ruling coalition as to exactly how much is needed. Though Germany has adopted the new spending target, it is not going to get there any time soon. Even if Ms Leyen's plans are realised, Germany will be spending only about 1.5 % of GDP on defence by 2024. Nonetheless, the shift in Germany's defence thinking is significant. It's a measure of the twin shocks of Vladimir Putin's assertiveness and Donald Trump's apparent questioning of the utility of Nato and the whole liberal order of which it is a part.